Last night I managed 1 night at home in the country and managed to free up an hour or so to try out the original MacDuff. If I'd had a full day I would have tried something more complex but since every thing was set up, I tried going through the scenario yet one more time. I won't recount the action again but in brief, yes, I still the rules better than the current one but I am reminded that it still won't handle any but small games in a reasonable time, especially if both sides are largely regular troops. Using a card draw for unit activation is a real pain if one is playing solo on a 6x8 table. Good exercise though. There is a lot to be said for both the alternate methods I've tried with these rules in the past: simultaneous moves according to written orders and igo-ugo based on an initiative roll. I see no reason why all 3 can't continue as options depending on the context (solo, 2 player, multi-player with gm etc). A revised sequence using a more traditional movement phase followed by a shooting phase would facilitate this. At one time I thought the resolution of shooting and movement throughout the turn as units were activated was an important part of the feel but I am not longer certain, dropping it would simplify many things. The original command radius of 24" is too generous, which is probably why I dropped it to 12" for the FIW version but the idea of only rolling when beyond command control was better than rolling for every unit every turn. The control test and modifiers need some editing. any other quibbles are minor but some are actual improvements to things that work. That's probably it for games for April, too busy relocating and renovating but work has already begun on the logistics of a small ancients mini-campaign for May/June (3-5 games expected). Casting and painting for the 19thC will finally resume at the same time in preparation for a summer campaign. A long post with lots of opinion, no pretty pictures and few facts. It might be more interestimg to go read the Illustrated New Durban Times issue containing my first ever solo wargame and rules comparison. I thought doing a comparison of these rules would be easy but while they all have very similar intent, they use such different methods of getting there that one is tempted to mumble something meaningless like "they all work so it all depends what you like". However, I will take a stab at highlighting some of the differences and what works for me and why I might choose one over another for a particular game. This would have all been much easier if the latest version of my own rules was so much superior to the others that there was no point in considering the us of anything else (grin) however it is more a case of pondering why I still have the desire to write my own after all. Perhaps a topic for another post. To start with, for anyone not familiar with any of the rules (Charge!, Black Powder and With MacDuff To The Frontier"), without meaning to put words in any of the author's mouths, none of these are meant as heavy duty "simulations". They are all first and foremost rules to play games with toy/model soldiers which reflect history without trying to recreate every detail with dreary consistency. This means that the ends sometimes justify the means which may frustrate some process oriented people who want to "see the work" as it were. In order to avoid any hidden bias, it might be best if I laid out my current thoughts on what the important features of a set of rules are. These are slightly different from what I would have said 10 years ago. Drama. This can be achieved in various ways but basically there has to be tension at some points, usually provided by periodic crucial die rolls with meaningful consequences. Uncertainty. This relates to drama but is not quite the same. War is an uncertain business and the wargame should be less deterministic than chess. There was a time, not long ago, when it was a major concern for me that a wargame general be unable to rely on his troops doing as they are told. I am less convinced now. In face to face games, your opponent's actions can throw huge unforeseen spanners in your works without any help from dice or cards. Now I worry that some games seem to contain so much uncertainty that the player is just trying to ride the wave rather than driving the action. Engaging. I want rules to require me to make meaningful decisions throughout the game and for there to be relatively direct consequences. Unobtrusiveness. I like rules that don't get in the way of the game so that players can think about tactics (in the non-technical sense) rather than about the rules and the game mechanics. Theoretically the ulttimate version of this would the umpire controlled kriegspiel, but in a game, I'd rather know what the rules are. Ideally, a player who knows his period tactics but doesn't know the rules, should be able to out perform someone who knows the rules inside out but doesn't know anything about the history behind them. I know some rules where the opposite is true. Heads Up. A corollary of the previous preference is that I prefer to play without a quick reference chart in hand. I don't mind a quick check of a reference sheet or the rules now and again when I'm dealing with something unusual or at least not customary, a situation or troops type that I don't normally encounter and so forth but I hate having to consult one or more charts every time I shoot, check morale etc. To achieve this I am willing to sacrifice detail and force things into patterns. Scale-able. It is very useful to have a set of rules that can be used for big battles and minor skirmishes between a handful of troops. So how did the rules stack up based on this very simple scenario? Charge! definitely has drama and engagement. 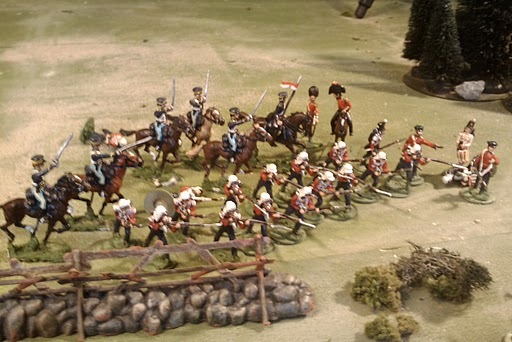 It comes from 2 sources, 1st the combat results can stray far off the average and be very decisive or be a wash, for example, a volley of close range musketry will normally damage the target severely but sometimes a fistful of 1's will make it ineffective, like the French Guards at Fontenoy while a couple of high dice can lead to breaking the enemy with a single volley like the British guards at the same battle. When you commit your troops, you take your chances.On the other hand, if you hang back at long range, with the best dice in the world, you opponent will need several volleys to break you and usually more but the opposite is also true. The choice is yours to commit or play it safe. The other source of drama comes from simultaneous written orders, sometimes your opponent can humbug you if you aren't successful in reading his mind as the game goes on. They are also unobtrusive and heads up capable with many rules being intuitive and those cases where knowing the technicalities helps are few and generally minor. It doesn't take long to memorize movement, ranges and combat. Lastly, to my mind, they look and feel right for Horse and Musket gaming, especially if players refrain from using Napoleonic tactics in mid-18thC games even if the rules don't prohibit them. They also cater well to various sized games, I've played large games with over 1,000 figures on table in a game which was a bathtub version of an historical battle, small games with just over a 100 figures clashing in some minor action and games of every size in between. More seriously, much of the uncertainty is lost if playing solo and some thought needs to be put into finding ways around that. Black Powder. These rules rate reasonably well for drama, uncertainty, engaging and being heads up. Within a few turns I didn't need to check on movement or shooting factors and would soon have had the rest. The morale chart might take a little longer and there are enough special rules to be potentially troublesome if too many are used or if they are used too rarely. I also have some concern that there might be too much uncertainty due to the potential impact of single die scores and the high odds of failing command rolls. The latter could easily be addressed by just fielding more capable commanders but I was still left at times feeling that the die rolls were more important than my decisions. The two small games that I have played are not enough to allow me to form a valid opinion of the flavour or the scalability though suspect that they will feel better for mid sized games. There is a certain generic block feel to the units despite optional special rules and I think they will feel best with multi-figure stands even thoigh they can be played just as well with singles. That leaves unobtrusiveness and I'm on the fence here as they are not intuitive the way Charge! is but at the same time the mechanisms are not so intrusive as to distract from the flow. I suspect though, that there are some important tricks to learn about getting the most our of your troops that have no real world relationship. I'm not at all sure how well they will handle table top teasers or campaigns where one wants to the same units to fight minor actions and big battles. I suspect they are flexible enough to be adapted to these sorts of things but, only more games will tell. Minor Quibbles. Two games is not much to go on but it looks to me like attacking infantry will ALWAYS get the first shot. Even with smootbore muskets attacking rifled armed troops, the attacker will normally get the 1st shot and with the same factor. If doing the Crimea or Indian Mutiny, I will probably give Enfield armed troops a fire bonus on top of the minor range extension, probably an extra fire die but possibly just the sharpshooter re-roll. An even smaller quibble is that infantry who can form square MUST do so if charged by cavalry. So much for the thin red streak! 4 STARS **** pending further playtesting which might drive it up or down 1 star. With MacDuff To The Frontier. Well, sighhhhhh, it used to be all those things, I think, but it seems to have lost some of the drama, results being either too gradual and predictable or too minor. It still has high levels of unpredictability in minor things but mostly in a non-decisive fashion. The gradualness that has crept in, also robs the game of some of its engaging nature as decisons can take several turns to have an effect allowing the brain to go on auto pilot while you execute the plan. Is it unobtrusive enough? I think so but its hard for me to judge since they are in my head. They definitely work heads up for me. (even if I accidently change them as I go!) Not having thought much about it recently, I think I may have lost some degree of flavour as well over the last 9 years. Scale-able? It used to be, I haven't played enough of the current version to judge if that has been lost as well but I think not. Alright! enough! Can they be fixed? Yes, I think so if I go backwards and rethink carefully. I dug out the original version yesterday, the Colonial one and it still looks pretty good to me, better than the F&IW version that I played more often and definitely better than the current version. Is there a reason to fix them? That will take more thought though I'll probably work on it anyway out of sheer bloody mindedness. Three Stars *** as some things still work and the game has some elements that I like. So where does this leave my gaming plans? NQSYW using the Prince August semi-flats will remain a Charge! game, I will use Black Powder for my AWI games both in 1/72nd plastic and 40mm metal (both multi-figure base projects which I had been planning to play using Morschauser Meets MacDuff ). A final decison is pending on my Universal Toy Soldier project (1830's - 50's 40mm). If I can fix MacDuff to my satisfaction, this is what it was really meant for, if not, I'll use Charge! for the particular flavour of individual toy soldiers over massed units. After a good night's sleep, the two armies were lined up again in their accustomed places, some hasty notes of proposed rule changes to MacDuff had been made and the game began. Since time was short I allowed a double move to start off. The US won initiative (this is a die roll) and advanced in reasonable orde (each unit rolls dice to see how many inches of movement it has that turn). The British also moved forward but the gun and the Tigers lagged behind. The US retained the initiative and closed up to the wall while the gun swung left.The cavalry advanced past the wall and wheeled towards the British. The British advanced and the Tigers wheeled to face the cavalry. On the next turn, still with the initiative the Dragoons reversed themselves and started for the left flank. The infantry and guns opened a long range fire on the British who closed the range then responded. On turn 4, the British seized the initiative. 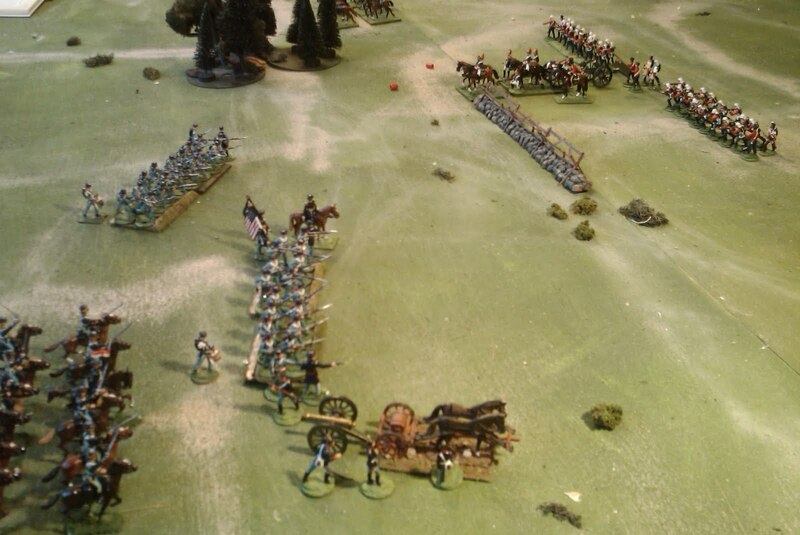 The GGBG charged the Dragoons who spurred forward in a counter charge. A fierce fire fight with the 3rd Infantry wheeling forward to straddle the wall for a better shot at the tigers, resulted in the US artillery retiring in disorder. The cavalry melee was a narrow victory for the British who decided to pursue the disordered US dragoons when these retired. A 2nd melee saw the Dragoons breaking and routing off table. On turn 5 the British retained the initiative. The GGBG, blown by their charges, failed to rally. The Tigers disordered from last turn's fire, fell back but the Young Buffs charged forward, breaking the 2nd US infantry then pursuing into the 3rd driving them back in disorder. The 3rd Infantry and gun rallied and returned fire on the enemy. On the 6th turn the GGBG still refused to rally, forcing the British general to gallop over and rally them in person. The Tigers rallied beside the gun while the Buffs rallied after their charge. The 2nd infantry failed to rally and continued to retreat. On the next turn, the US regained the initiative but the 3rd infantry still refused to rally and when the General rode over in person, cussing them and beating them with the flat of his sword, they finally broke and streamed off the field. This left the artillery with no choice but to limber and ride off, hoping that the British cavalry would let them go. Last game to the British. Next post a discussion of how the rules compared to each other, what worked for me and what didn't. The 3rd run through of the game used the most recent edition of my own "With MacDuff to the Frontier" rules.In light of what followed, I feel that some background information might help. These rules started life a little over 15 years ago as a set of Victorian Colonial rules and were being modified for the F&IW when the Courier picked them up and published them in '97. They represent my first steps towards what is now considered Old School rules. At the time I was increasingly tired of complex and competition oriented rules and had been re-reading Charge! in particular and so several ideas were lifted directly from there though some were more modern, influenced by magazine articles (one called "Sin Bin's and Stragglers" or something like that was one). I had some great games with these rules and they were one of my favorites, unfortunately I hit a snag. Many of the games we played were drawn from CS Grant's Scenarios for Wargames. When we played Sudan or NW Frontier games using 12 man British companies and 20 man "Native" tribes as a "unit" the rules worked well and the Friday night games were generally finished in 4-5 hours. By 1999 I had 2 sets of almost the same rules (Colonial & F&IW) and was mostly using them for War of 1812 and 1860's games with small regiments as the unit. These games were good but often took 6 to 8 hours to reach a conclusion. Occasionally I had time and energy for an all day Saturday game but not often. I decided I needed to do 2 things, harmonize the small differences between the rules to make it easier to switch back and forth and find a way to shorten the games. So far so good but life is not a vacuum and several other factors changed and I went from playing regular games with a small group to playing significantly fewer games but with a wider exposure to other gamers. The end result was despite bold declarations to the contrary my commitment to the Old Schoolishness waned and I started worrying more again about consistency of detail and process, and I lacked the opportunity to play test changes properly. I also, I think, mis-identified the solution to making a shorter game, I tried to make the turns faster instead of making them more decisive. The result was a long stream of tinkering and endless versions until even I got tired of it and eventually I became fascinated with Joe Morschauser and wrote a simple set of rules for battles which worked really well for short sharp games. They worked so well that I started tinkering with them as well ! Once I had finally gotten them properly to the point of non-exciting I came back to MacDuff last fall and wrote what was hopefully a final solution. A test game during my Game of the Week project (see scenario 45) felt successful and greatly pleased me. So, I had high hopes for last week's game, the 1st MacDuff game since then. The game proceeded smoothly and displayed various features I had wanted and produced a see- saw battle but after an hour or so I realized that the rules had committed the chief sin that a set of rules can commit, not historical inaccuracy, no much worse, I WAS BORED! Shock! and horror! After 11 turns I called it a draw and fell back to regroup. Was this the final nail in MacDuff's coffin? Turn 6, The US 2nd Dragoons are falling back in disorder from the cavalry melee but will rally, return to the fray on turn 8, break the GGBG and on turn 10 will charge the Buffs and, these having chosen to stand and fire rather than form square, will break them. By turn 11 the battered dragoons will face a gun and the tattered remnants of the Tigers. Over night, I calmed down and analysed the situation. There were several minor issues but the real culprit was that the game lacked drama and tended towards inconclusive results. I contemplated various things that had been removed from the rules in the past and various new ideas that had been tried and rejected and thought about the other rules, In the end while there many other valid things that I could do, the main thing would be to remove some of the restrictions in movement and restore the deadliness of combat to something like its original levels. Having an unexpected extra day off, I decided to remove the 3rd game from the series, set up a 4th game, reloaded the camera with fresh batteries and went at it again. The next post will cover the 4th game and then I will post a summary of my thoughts on the 3 sets of rules as they were experienced during the replays. The 2nd run through of the sample game from Don Featherstone's Battles With Model Soldiers (see 9 April post) was fought using Black Powder. Coincidently this was also my 2nd game with these rules, my first solo one. I hoped that the combination of alternate moves with the uncertainty of the command rolls would make this a good set of solo rules. They are, but, while I like saving throws enough when I'm countering an opponent's fire or anxiously watching him try to counter mine, not for the first time, I found saving throws tedious when I'm playing against myself, possibly its due to not knowing who to cheer for. Conceptually the Red army was supposed to be the "good guys" and the Blue army the "bad guys" but I've grown very attached to my Boys in Blue. I declared all units to be standard sized and used the generic template for stats except that I gave the cavalry the marauder rule which allows them to operate on their own as they did in the original battle, and gave the infantry the square ability and first fire. Each side had just 1 CV 8 general. The game got off to a slow start with both commanders just squeaking out 1 move for all units. On the 2nd move things began to be interesting. The US general decided on a brigade order to the infantry and guns to be followed by a separate order to the cavalry. The 1st order was for the infantry to advance and wheel left, the gun was to move to the left flank. rattle rattle, roll....boxcars! A Blunder! Another roll and a quick check of the chart and yes all units move to their right! ("Hayfoot, Strawfoot", came to mind followed by the voice of the old drill sergeant "YOUR OTHER LEFT!! sir" ). This ended the US turn leaving the cavalry stranded. The British, calmly advanced 1 move again. On the 3rd move the US infantry and gun advanced in the proper direction and opened fire counting the target as not a clear shot due to the stone wall. The Dragoons, bemused perhaps by all this marching and counter marching refused any and all orders. The infantry and artillery fire succeeded, after saves, in inflicting 1 hit a piece on the limbered gun and the 49th Foot but more importantly, a 6 had thrown the gun into disorder. This meant it was immobilized, no doubt held up by the need to cut the traces to a dead lead horse. The rest of the British units plodded forward 1 move and opened fire with minimal effect. On the 4th move, The Dragoons finally shook out and moved left, the infantry and guns stood and fired to little effect. The Bengal Horse Artillery was now clear to go but upon being ordered to unlimber, refused, ending the turn. Belatedly, I remembered that limbered artillery and march columns always get at least 1 action unless there is a blunder. I went back and unlimbered it and they fired a salvo into the ground. The infantry fire on the other hand now disordered the 2nd Infantry. On the 5th move the cavalry units finally clashed while the firefight continued. With 8 dice a side and a charge bonus meaning 3 or better to hit casualties were steep despite some good saving throws. The GG Bodyguard suffered worse with 4 hits and lost the melee, shaken with an excess casualty. 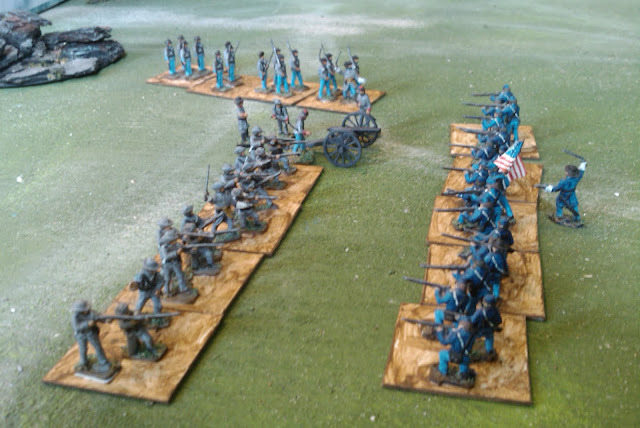 A mediocre morale throw of 5 on 2 dice was not quite enough to stop them from breaking and fleeing the field while the US Dragoons swept forward. (an after combat bonus move referred to as a "sweeping advance".) It was now the turn of the British to blunder and an order to the Buffs to face the cavalry became an advance instead, resting their flank on the woods. (not as dumb as they look). This ended movement but the British fire inflicted another hit on the 2nd Infantry leaving them disordered and shaken. On the 6th turn the 3rd infantry and the gun used their initiative to move forward into close range, then failed to hit anything. The 2nd fired at reduced effect but were lucky and disordered the Buffs, delaying any charge. The cavalry,ordered to charge the guns but doubtless too tired to gallop anymore but too canny to get too close made 1 move and stopped, just beyond 12" from the gun, in other words, just too far away to allow the gun an automatic reaction during the initiative phase. The fire from the 2nd infantry and the US artillery disordered both British regiments. This left the gun as the only unit eligible to receive an order, of course since they had refused every other order, they saw no reason to obey now and failed to face the cavalry and also failed to hit anything. The disordered Young Buffs, however, poured in a heavy fire routing the 2nd infantry. On turn 7, the 3rd Infantry wheeled back to protect its flank left open by the rout of the 2nd. The cavalry gleefully accepted an order to charge the flank of the gun, over running it and continuing on to roll up the 49th from behind their flank. The Young Buffs faded back into the woods and were allowed to go. Round 2 to the US. Tomorrow, or maybe Monday, With MacDuff To the Frontier meets Featherstone. If I decide to use Charge! 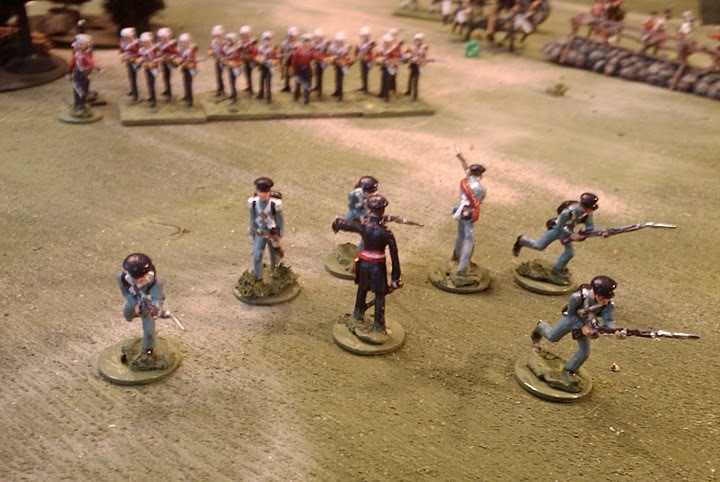 for my solo 40mm, mid-19thC toy soldier games there are some issues to be considered. This post is a brief look at some of them with proposed solutions. COMMAND & CONTROL. On the surface, there is no role for generals or other officers in Charge!. Is this a problem? Once upon a time I certainly thought so and at some level I would like generals in particular to have some sort of command role and preferably a personality as well. I suppose the next question should be "what is their battlefield role in life?". The commanding general's role is to decide on and implement a battle plan, largely by means of orders to subordinate commanders as to where they should post their units and what their mission is, how they should achieve it and when they should do so. In a wargame, this is the role of the player and the miniature general is his avatar if you will. In the absence of command control rules, the miniature general's placement on the table is largely one of keeping up appearances. Is that a problem? perhaps if playing with an unimaginative player but why would I want to? Especially when playing solo! No I think I can live with this. - Units under the control of a Rash brigadier or colonel will treat an order to advance as an order to charge charge if infantry or cavalry with an enemy in reach. An order to retreat will be ignored. Units under a cautious brigadier or colonel will obey an order to retreat but will not advance. Other units will throw a scatter die and move the amount ordered in that direction if possible. Regimental officers have a dual function of controlling the troops under their command, usually by yelling commands, and of maintaining order and discipline. In game terms, they are an extra body in melee as well as augmenting the strength of a regiment thus allowing it to take more hits before having to retreat. A standard unit will have 48 muskets and 12 officers, nco's and drummers. This is way out of proportion but can be seen as representing their influence in maintaining discipline. I can live with this as is. ARTILLERY. Charge! has only 1 form of artillery. Upon reflection, I can live with no distinction between field, horse and light artillery and my 1830's - 50's time period is really too early for common use of machine guns and rifled artillery. But, I think I would like heavy artillery, not 12 pounders and the like but the really big ones like Peel's navy guns at Lucknow. I also need to think about effectiveness of Mahratta and Sikh heavy guns. I don't, however, want to make a lot of changes. At present I am going to refrain from penalizing non-European artillery except perhaps to field fewer guns proportionally (eg a gun model might represent 6 British guns but 10 Mahratta ones). The question is why use heavy guns at all? They seem to have been used for 2 main reasons, first is battering holes in things, the other is that they have a longer range. To represent the latter I am thinking of adding +1 to their "to hit" roll. This means automatic hits out to 24" and a possibility of hitting out to 7 feet. I will leave the effect alone as a 24 pdr ball whipping through a line does no more damage than a 6pdr. It would do more damage against a column but I think the overall increase in number of hits will reflect their effect with out getting into any greater complexity. Why not use all heavy guns? They are usually less mobile. So, a heavy gun which moves up to 6", pivots in place or unlimbers, cannot fire that turn. (as opposed to dicing for it). A heavy gun which moves 12" must end the turn limbered (facing away if limbers are not used). A heavy gun may not move more than 12". I contemplated allowing them a "special effect" on a roll of 5 or 6 but will trust that the easier "to hit" roll will be enough. That just leaves rockets. I'd leave them as ordinary guns but cannister just doesn't seem right and anyway where's the fun in that? So rockets cannot fire cannister (ie dice for effect are always 1/2) but they ignore cover due to the high angle. If the "to hit" scores 1 then there is a rogue rocket, from the mid point on the rocket's flight path, roll a scatter die and the rest of the flight is in that direction. If it lands on a unit of either side then roll for effect. NATIVE SPEARMEN. No problem here, just infantry that can't shoot, tough ones are grenadiers, iify ones are militia, sneaky ones are light infantry. RIFLES. Most troops are still using muskets during this period but those pesky rifles are starting to be issued and taking effect. I am tempted to ignore them and indeed, I already think of all light infantry in Charge! as riflemen, but if doing the Crimea or Mutiny etc., they must be taken into effect. I don't want to double ranges, make the already deadly close range fire even more so, or introduce new mechanism's. My current favorite solution is to say that Minie rifle volleys inflict the standard number of casualties at long range. This reflects that the smoothbores are still deadly at close range but at a disadvantage at longer ranges and that armies were still experimenting with the new weapons and haven't yet learned to make the most of the increased long ranges. MODERN TECHNOLOGY and (mild) VSF. In most cases, any transport device will follow the basic rules for boats but with particular details. BALLOONS. Balloons are treated as boats as far as embarkation which includes rising to altitude and vice versa. An observation balloon must be tethered but allows a player to look into dead ground and force his opponent to deploy troops hidden there. It also forces a player to announce units moving onto the table, a turn in advance. (it follows that if rolling for reinforcements etc, this must be done the turn before). A balloon which is not tethered will move 12" in the direction that the wind is blowing (use a scatter die or other method to determine the wind before the start of the game. Either leave the wind alone once established or roll 2 dice at the start of each turn and add the numbers: 2 = a calm, windspeed 0", 3= wind shifts 45 degrees left, 4-10 normal wind, 11= wind shifts 45 degrees right, 12 means a gale, all balloons must descend or be blown off table. A powered balloon is treated as a boat for movement except that it can move in any direction. 18" with the wind, 12" across it, 6" against it. STEAM TRAINS. Treat as boats. They move as if with the current if on rails, as if moving against the current if cross country (only VSF at this point), cannot enter woods or cross obstacles. An armoured train will count as a house for combat. i.e. gives cover and any attacker has to follow the rules for breaking in if they charge one. SOLO PLAY. There are 2 main approaches to solo play, one is to play both armies to the best of your impartial abilities, the other is to program one or both sides using some combination of cards, charts and dice. I don't enjoy the latter as much and sometimes its harder to come up with a good story so I tend to lean towards swapping hats. That doesn't work as well with simultaneous moves such as Charge! uses. I have used the alternate move system from the basic game but it requires carrying over information like "is this unit the one that fired first and so the casualties come off before it shoots or is it returning fire and thus the dead un's can shoot back". Having come across some good ideas on Pauly Wauly's Wargames Blog, I'm thinking of trying order chits, either home made or adapting my Command Decision ones if I can find them. I'll roll initiative with the high side placing orders first, then the 2nd side. No pre-measuring will be allowed. Going first will allow a side to shape the action but going second will allow fore-knowledge and a chance to retreat non-pinned units or move to intercept etc. Once all orders are placed, the game will carry on as normal. Just a wee diversion from wargames, after 25 years in IT support, I'm well aware of the importance of backing up data at home as well as at work. I don't know how often I sat and tried my best to look patient and understanding while someone poured out their woes and how they did back up their data, just last year or was it the year before, and of course some of the files are on the net, and they really meant to do it again, esp when their computer was starting to have trouble but they were busy and needed to go out and buy some new dvd's or a memory stick and now, all those pictures of friends, games and figures, esp the once since sold off, the rules drafts and past failures, historical articles and books sought out and downloaded........ Well you know. A requiem for my old laptop will be held tonight, in the mean time, I'm going to go look in the mirror and look patient and understanding. Exeunt humming "freedom's just another word for......."
BWMS - Introduction and Charge! Keeping in mind Don Featherstone's views on battle reports, as mentioned in CS Grant's The Wargame Companion, I shall avoid any pretense on reporting an actual battle and instead will comment on how the rules affected the games. It was my intention to record die rolls, movement etc., but ...........if life were WRG 3rd ed, I would be "D class", what later rules called "Irregular C" or "Warband". In other words I lack the required discipline and devotion to book-keeping that a good QM should and once the action began, I only remembered periodically to make a few cryptic hieroglyphs to guide future historians. I'm afraid memory cross referenced with interpretations of periodic photographs will have to make good the lapses. The sharp eyed amongst us may have noticed that the British Army appears to have dressed in anticipation of invading Scinde or Gwalior or some other such plump if troublesome target while the US forces appear more prepared for hot Mexico than cold Canada but rather than launch into a prolonged explanation of how they actually got here from there, I will merely remark that Canadian summers can be quite hot and humid and such tropical dress is quite appropriate. Or, imagine if you will in 1844, the Oregon Crisis is in full swing and the decision has been made to send a force from India across the Pacific to reinforce Fort Vancouver on the Columbia River (not to be confused with either Vancouver BC, site of the recent Olympics, or Vancouver Island where you will find Saxe-Bearstein), the 31st Foot, the Young Buffs, (taking a break between Afghanistan and the Sikh War), the 49th Foot (who having recently served in China were close at hand), a battery of the Bengal Horse Artillery, (because of their striking uniform and as John noted, one just doesn't see them enough) and last but not least the Governor General's Bodyguard. (ummh who marched across the Prairies, blazing the trail for the NWMP to follow perhaps?) Meanwhile, up the Oregon Trail comes marching General Scott with the 2nd Dragoons, 2nd and 3rd Infantry and a battery of artillery in a new experimental helmet. Turning now to more practical matters, I decided that each game would start out as per the book and follow the original orders as far as possible. Obviously, as the games progressed, this became increasingly difficult but I tried to be guided by their spirit of direct aggression when all else failed. Here is the original layout. Since the set up was the same each game, I won't repeat the set up picture for each. It may be noted that the US forces are filling in for the Confederates and the British for the Union, this was a random choice but may indicate an ingrained instinct to view the boys in blue as rebels while those in red represent government and the rule of law. That's the US 2nd infantry holding the left flank with the 3rd infantry in the middle. (precedence having been decided years ago by the order of painting). The first game was played using Charge!. This is a venerable set of rules that gets better and more clever, the more I use them. I have met few rules that manage to do such a good job of subtly encouraging proper tactics. This is not obvious at first glance as it cheerfully lets you do all sorts of silly things, it just punishes you for doing so until you learn better, and it does so while you are having fun playing a simple game. Like my parents, Lawford & Young became wiser as I grew older! Unfortunately, the game has 1 great lack as a set of solo rules, they are designed for simultaneous moves in accordance with written orders. This creates a great deal of uncertainty in face to face games but even my poor memory can recall what I wrote for the Red army when I start writing for Blue. I have been casually pondering various work-arounds, using the alternate system from the basic rules, writing orders for 1 side then using dice or cards to select orders for the other side based on a quick list of reasonable options, etc, but here there is no problem as the original 3rd game was run by the same written order method and the orders for each turn were reproduced for me to follow. Any one familiar with the rules will note that it calls for regiments to be substantially larger than the 20 men used by Don. I simply treated each company/squadron as an independent unit for all purposes. The game began with both sides stepping off briskly then me realizing that I had the formation wrong and that the movement distances didn't match. This was easily solved by repeating the 1st turn orders while calmly reforming my companies into line. The game moved along smoothly with both guns deploying on the 3rd turn and successfully firing on the enemy. The British hitting 3 infantrymen of the 2nd infantry, the US scoring 3 hits on the cavalry which halved and then rounded up gave 2 dead. The US infantry was also in position to open fire. Neither side was at the wall but a quick check showed that my instinct was right and the wall was treated as cover not as blocking terrain if the target was beyond it but not touching. This meant that the 3rd Infantry volleys were quartered but still ended up inflicting 2 hits on the 49th Foot while the 2nd Infantry with no interference from the wall managed 3 hits on the Buffs. On turn 4, the GG Bodyguard charged the US gun from just beyond pinning range but the 2nd Dragoons, hurrying forward with orders to charge in support of the guns managed to get in the way and a cavalry melee took place while the US gun turned to join the firefight now in progress. The Bengal gunners were particularly effective and the 2nd infantry was perilously close to going understrength. The cavalry melee saw the British with a slight advantage but a die roll determined that there would be a 2nd round. This was a big relief to the US artillery as it meant that even if the British won, their cavalry would be out of it until turn 8. Turn 5 saw the firefight continue with the US suffering from an ill judged order to advance 2" into 12" range. This meant yet another turn where the gun had moved slightly or turned and therefore had to dice with odds meaning that the gun was unable to fire. They had been lucky so far but not this turn. Perhaps there was a brief rain shower as none of the fire this turn was particularly effective. The US general finally woke up to the dangers of hanging about under close range cannister fire and ordered the 2nd Infantry to advance. The cavalry was unaffected however, and when the dust was settled the 2nd Dragoons had to surrender a prisoner and rally back for 3 turns. The GG Bodyguard rallied their 2 turns on the spot, watching the enemy artillery with a wolfish gleam in their eyes, or perhaps it was just the gloss varnish. Turn 6 saw the tattered remnants of the 2nd Infantry stepping forward again and declaring short range musket fire against the Bengal Artillery, silencing them. It was a bit late though and the fire from the British infantry was enough to reduce both US infantry units to below 1/2 strength and on the next turn they commenced their retreat. Turn 7 saw the US gun retire 6", wheeling to face the cavalry but again failing to fire as they did so. (Perhaps if they weren't using an improvised limber drawn by 2 scrawny horses, they might maneuver better) The remaining Bengal gunners managed to roll a 1 and miss while the British infantry crossed the wall and began a menacing advance. On Turn 8, the GG Bodyguard rallied and spurred forward against the gun which was now covering the retreat of the US army. The gunners managed to bring down one cavalryman before they were over run. Round 1 to the British. Tomorrow, on to Black Powder. A shot of the Black Powder game just after the US forces were ordered to wheel left........."no! Your other left!" Most of the pictures are on my camera and will have to wait till I get back to town and upload them to my computer. The really good news is that they recently upgrade cable facilities on my country road and ny the time we get finally and fully moved in, in 3 weeks time, we'll have highspeed internet. Today's blog entries are coming via my cell phone. I'm probably breaking copywright but hopefully Don will forgive me. 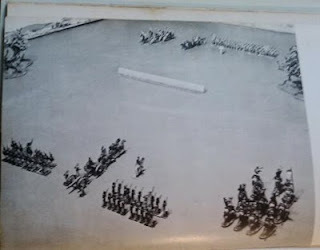 The picture is from Don Featherstone's Battles With Model Soldiers and shows the introductory game that I am about to replay. The troops that I selected came from my 40mm fictional armies representing the forces of Oberhilse and Faraway. They are a mix of original figures and conversions of Scruby figures (from Historifigs) and Zinnbrigade homecast figures, and 1 Irregular guardsman. Since Don doesn't seem to have gone in for the Imagi-Nation thing, I decided that these armies would stand in for 1839 British and American forces. One of the problems I have had with this project over the decade that it has been simmering, is that I have had trouble deciding just what I want it to be and what sort of rules I want to use. Should it be a small number of large units for semi skirmish games suitable to the Canadian rebellions with what if US involvment or a heated up Aroostock War or a larger number of small units to refight the Sikh and Mex-American War? Should I use Charge! and single figures or a set written for fixed stands or...etc. So, not surprisingly, organization is a bit at sea. Lately I have been leaning towards units of 24 infantry or 12 cavalry and batteries of 2 guns org 4 crew each. For this game which originally used units of 20 infantry or 9 cavalry with 2 officers and single gun batteries with 4 crew, I went with Charge companies with 16 muskets plus officer, sergeant and drummer, but guns with 4 crew and 12 man squadrons of all ranks. Nor sure why! Set up was by the book but on the 1st move of the 1st game I noticed a discrepency. In the photo, the infantry is shown deep. Having now read Wargames, I realized that only the front rank can fire and so this is a sort of reinforced line, so I deployed the companies 4 deep. When I started following the written orders in the book, I saw that it specifies that all units deployed 1 deep. I quietly changed formations as the armies advanced and deployed in firing line in subsequent refights. The 1st battle reports should be up by Friday. For those Featherstone fans, esp those with a connection to Battles with Model Soldiers, and those who enjoy a blow by blow look at how a set of rules plays, I recommend dropping over to Steve's Random Musing blog for his refight of the intro scenario from said book using Regimental F&F. Now, it came as a jolt to me that, although I have reread the original a hundred times or more, I have no memory of playing it out. Odds are I did when I was 15 and my copy of the book new but I have no memory. This is going to be a busy month what with wrapping up a business, moving house etc but I should be able to find time for this. Now technically I should probably use some of these lads (shown above) but I have a hunger on me to get my shiny 40s on the table. The plan is to run through this short scenario, the 3rd, all arms version, using the original deployment and following the original battleplans as closely as events allow, using various rules. An exercise for Black Powder, a comparison to the latest version of With Macduff, probably Charge! since its on mind after the recent games and possibly Featherstone's own.